This book fulfills my "read a book set in a land you will likely never visit" requirement for the 2012 Back to the Classics Challenge. So begins one of the most well-loved, well-read fantasy novels of all time. And one, I am ashamed to admit, that I had not read until this year. Though I read--and loved!--the Lord of the Rings trilogy, I put off reading The Hobbit because I feared it would take as much, well, work as the trilogy did. Now that I've read it (in a two-day sitting, mind you), none of my reasons for postponement remain valid. The Hobbit is, truly, the younger sibling to the LOTR trilogy: linear, jocular, and downright silly at times. 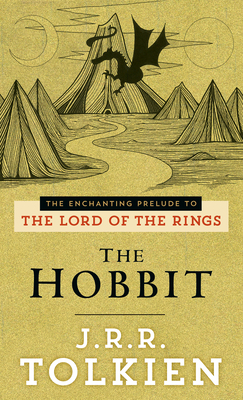 Full of songs and poems and chants, the story focuses on Bilbo Baggins and his adventures, setting off from the Shire on a very Tookish mission to help a band of goblins kill a dragon and recover some stolen treasure. Along the way, they encounter trolls and wolves and eagles and magic and elves and everything in between, setting the magical stage for the world that Tolkien more fully develops in LOTR and beyond. There's not much I can add to the already numerous conversations that exist around The Hobbit; I'm probably one of the last Tolkien fans in the world to finally get my act together and read it. But I can say that I was pleasantly surprised by the simplicity of a complex fantasy story, the bits that hinted at the world we come to know in more detail in the LOTR trilogy, and the humor and wit sprinkled throughout the text. The Hobbit is a quintessential--perhaps the quintessential--adventure novel, further proving what we all know already: Tolkien was one cool dude. Into the woods and out of the woods.